Let me start by thanking the University of Michigan, the host of today’s event, for the kind invitation. 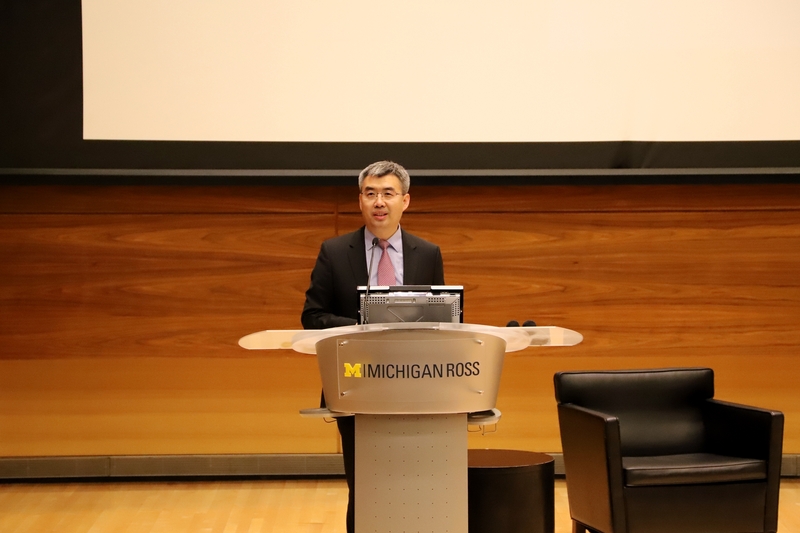 The University of Michigan was the first American university I have visited since becoming Chinese Consul General in Chicago. This beautiful, world-class university was also the first university visited by the Chinese ping-pong team on their American tour 47 years ago, thus making it the foremost witness of what came to be known as the China-US “ping-pong diplomacy”. It is worth mentioning that Mr. Woodcock, the first US ambassador to China, taught Political Science courses at your university for quite some time after leaving his diplomatic post. On this occasion of the 40th anniversary of the establishment of diplomatic relations between China and the United States, it gives me great pleasure to be with you all, exchanging views on China-US relation and renewing our commitment to foster closer ties between our two great nations. The year 2019 marks the 70th anniversary of the founding of the People’s Republic of China. Over the past 70 years, the great nation of the Chinese people has undergone dramatic changes. Under the leadership of the Communist Party of China, the Chinese people have completed in a few decades the industrialization process, turning China into the world’s second largest economy, the largest trader in goods, the second largest consumer of goods and the second largest destination for foreign investment. These advancements have lifted hundreds of millions of Chinese people out of poverty and enabled them to lead a life of moderate prosperity. Over the past 70 years, while spurring development within its own borders, China has also made significant contributions to global peace and development. For many consecutive years now, China has contributed nearly 30% to global economic growth. With its “Belt and Road” Initiative and the China International Import Expo, China has worked with the world’s nations in establishing new platforms of international cooperation, fostering new space and dynamics for global development. Moreover, for many years, China has been the biggest personnel contributor to the UN peacekeeping missions among the five permanent members of the UN Security Council. Now committed to building a community of a shared future for mankind, China is providing more public goods to the international community. The achievements China has made over the past 70 years have not fallen from the sky. Rather, they have come from the diligence, wisdom, courage and sacrifices of the Chinese people, who, with unremitting perseverance and striking determination, have turned the impossible into the possible. First, China has made these achievements by sticking firmly to its own path of development. For China, a nation with a civilization of over 5,000 years and a population of over 1.3 billion, there is no precedent to follow when it comes to national development. As President Xi Jinping has put it, whether the shoes fit or not, only the wearer himself knows; whether a nation’s path of development fits or not, only its people know best. After years of exploration, opening their minds and seeking truth from fact along the way, the Chinese people have opened a new horizon for development and blazed the path of Socialism with Chinese Characteristics, a path that has been proven suitable to China’s national conditions. Second, China is committed to deepening reform and opening wider to the world. We have consistently made economic development and meeting the people’s needs for better life our priority and remained devoted to deepening reforms in all aspects. We have made brave attempts and bold changes where we can, and kept liberating and developing social productivity to enable China to stay ahead of the times. With openness comes progress; with seclusion comes backwardness. China cannot develop itself in isolation from the world, and the world needs China for global prosperity. After years of great efforts, China has created a new pattern of comprehensive, multi-leveled and wide-ranging opening up. Third, China is committed to peaceful development and win-win cooperation. The Chinese people love and cherish peace and have long recognized the truth that no matter how strong a country is, the thirst for war will inevitably lead it to demise. China pursues a national defense policy that is defensive in nature, and China’s development poses no threat to any other country. As President Xi has said, China’s development has benefited from the international community, and we are ready to provide more public goods to the international community. China will never pursue development at the expense of other nations’ interests, because we believe that only win-win cooperation is the right way forward and only when everyone profits is there true gain. China stays committed to working with other nations in the world to make economic globalization more open, inclusive, balanced and beneficial for all and create more development opportunities for all nations. 40 years ago, China and the US reached out to each other for the benefit of the people of the two nations and for the peace, stability and prosperity of the world. Over the past 40 years, despite the ups and downs, this relationship has achieved historic development. The current level of exchanges and cooperation between our two countries was unimaginable 40 years ago. 40 years ago, China-US bilateral trade was less than $2.5 billion and mutual investment was almost zero; in 2017, our two-way trade exceeded $580 billion and, by the end of that year, mutual investment of all kinds had accumulated to $230 billion. 40 years ago, only a few thousand people traveled between China and the US annually; in 2017, that number increased to 5.3 million, and there were more than 400 thousand Chinese students studying in the US and 20 thousand US students studying in China. On top of that, 50 friendly province-state and 227 sister-city relationships have been established. Over the past 40 years, bilateral, regional and global cooperation between the two countries have been very fruitful. From regional hot-spots to counter-terrorism and nonproliferation, from addressing global financial crisis to environment protection, and from disease control to moon exploration, the list of areas of China-US cooperation is growing longer and longer. While remarkable changes have taken place in this relationship, there are many things that have not changed. First, the importance of this relationship to the welfare of the people of the two countries and the broader world has not changed. This is a relationship between the largest developing and developed countries in the world, which not only directly affects the welfare of our two peoples but also bears on the global peace, stability and prosperity. A sound China-US relationship serves the fundamental interests of our people and meets the expectations of the wider international community. Second, the fact that our common interests far outweigh our differences has not changed. Although China and the US have different national conditions and levels of development, as well as different cultures, histories and ideologies, we have shared responsibility and broad common interests in maintaining regional and global peace and prosperity. The China-US relations are not a zero-sum game. We both stand to gain from cooperation and lose from confrontation. China is committed to working with the US to promote China-US relations based on coordination, cooperation and stability. And President Trump also said that it is his priority to promote cooperative and constructive US-China relations. Third, the beneficial nature of this relationship has not changed. The development of China-US relations has brought real benefits to the people of the two countries. Take our economic and trade cooperation for example, the US provides China with huge and stable external demand, and American enterprises that have invested in China have played a positive role in promoting China’s economic development and industrial transformation and upgrading. According to the statistics, the average US household costs have dropped by $850 annually thanks to China-US trade. And China’s ever-growing development and ever-opening market will provide new cooperation opportunities for both countries. Fourth, the need for both sides to respect each other, enhance mutual trust and seek common ground while defusing differences has not changed. The three China-US joint communiques and the important consensus reached by leaders of the two countries have provided a fundamental guideline for the two sides to properly manage relations. Respecting each other’s sovereignty, security and development interests and managing differences through dialogue and consultation is key to maintaining the sound and stable development of bilateral relations. Fifth, the goodwill and friendship between the Chinese and American people and their aspiration for deeper mutual understanding and cooperation have not changed. This is the fundamental driving force of our relations. Since assuming my new post, I have been overwhelmed by the great passion of the Midwestern states for closer exchanges and cooperation with China. The event today is in itself a demonstration of this university’s commitment and support for China-US cooperation and people-to-people exchanges. Going forward, we need to keep an open mind, follow the will of the people, and encourage more interactions between people of all circles to further consolidate the public support for bilateral relations. I believe that the US education community, including the University of Michigan, and people of all other communities will continue to play an important role in this regard. The theme of today’s forum is “Empower the Transformation”. As President Xi has noted, a nation will prosper only when its young people thrive. China’s future rests in the hands of the young generations—so does the future of the China-US relations. I hope that the Chinese and American students here will work hard to live up to the expectations of the time and actively engage with each other to build bridges of greater exchanges and mutual understanding between the Chinese and American people and contribute more to the continued development of China-US relations.